Creating and sharing visual content is just one part of a social media strategy. You need to be able to determine the effectiveness your strategy. 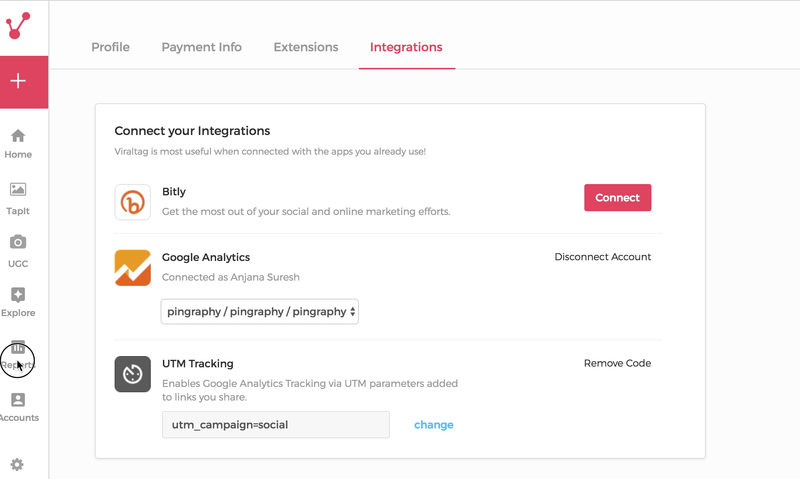 You can now do this by connecting your Google Analytics account to Viraltag so that you can see how your strategy is impacting traffic to your website. 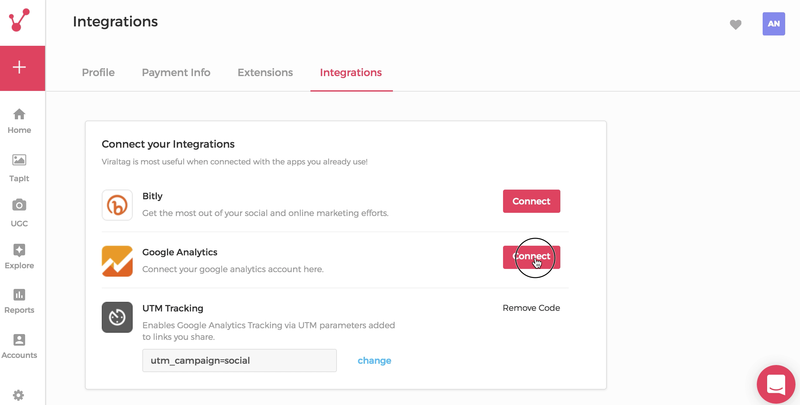 Before we get into measuring the effectiveness of visual content, let's show you how to set up Google Analytics for Viraltag. 1. Click on "Settings" from the panel at the left hand side of the screen. 4. 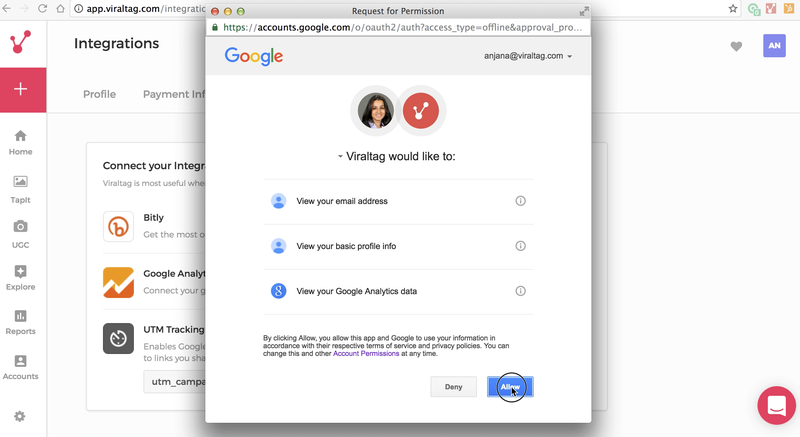 After logging into your Gmail account, you will be directed to a page where you will be asked to provide permission for Viraltag to view your email address, basic profile info and Google Analytics data. If you would like to proceed, click on "Allow"
5. 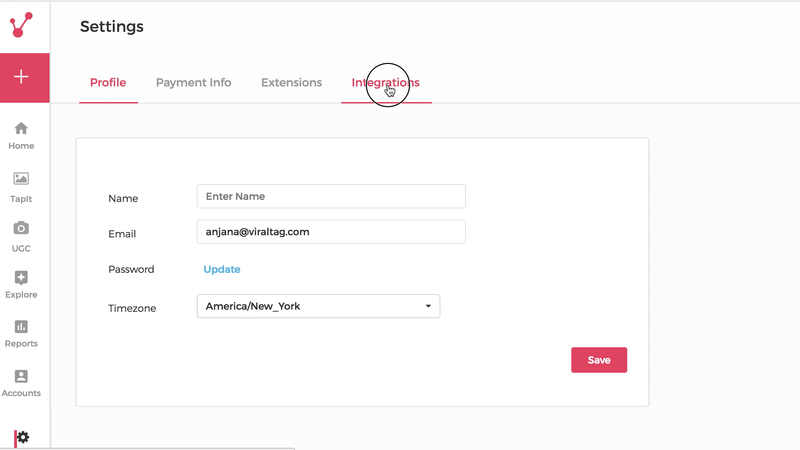 You will be redirected to the Viraltag app page. Select your Account, Properties and Profiles, and click on "Save". 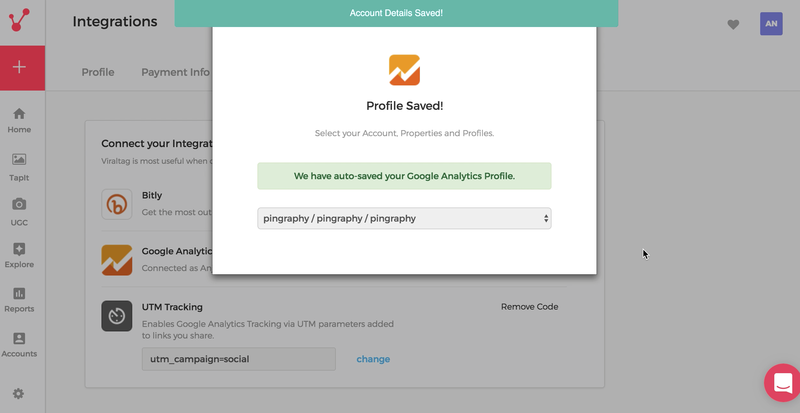 If you have integrated Google analytics before, the Profile will get auto saved. 6. 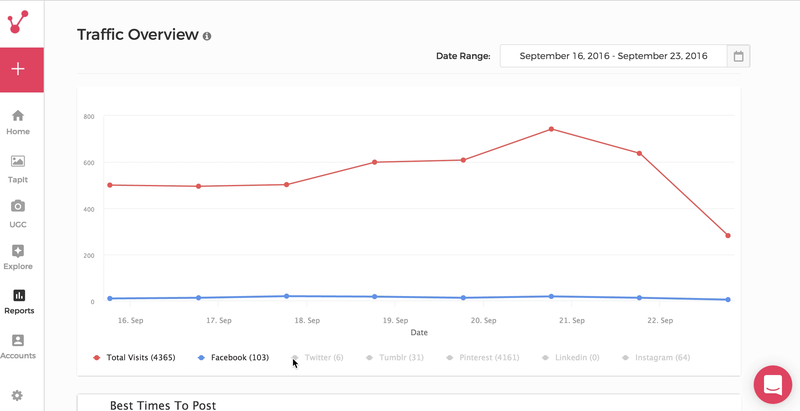 You have now successfully set up your Google Analytics account for Viraltag. 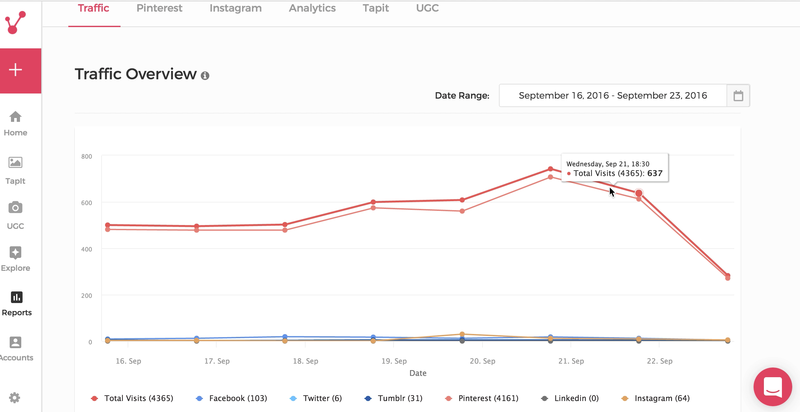 Once your Google Analytics has been integrated with Viraltag, you will be able to see a graph that shows all the traffic to your website from different social mediums. 2. 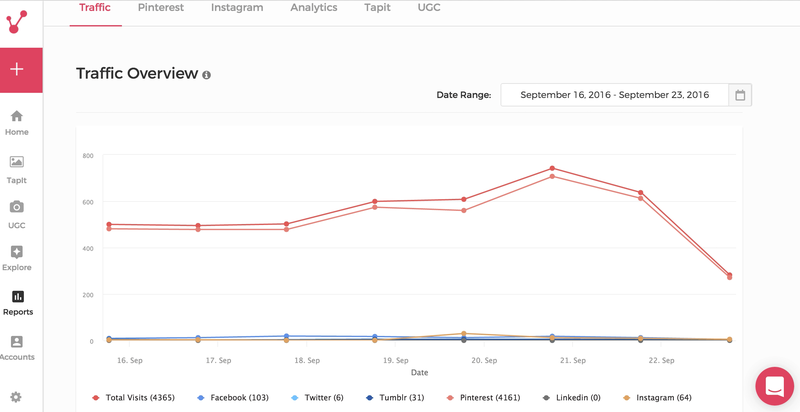 You will be able to see a graph that shows the total visits to your website from different social media platforms. 3. If you hover your cursor over the graph line, you can see the exact number of people who visited your website through that particular platform at a specific date and time. 4. 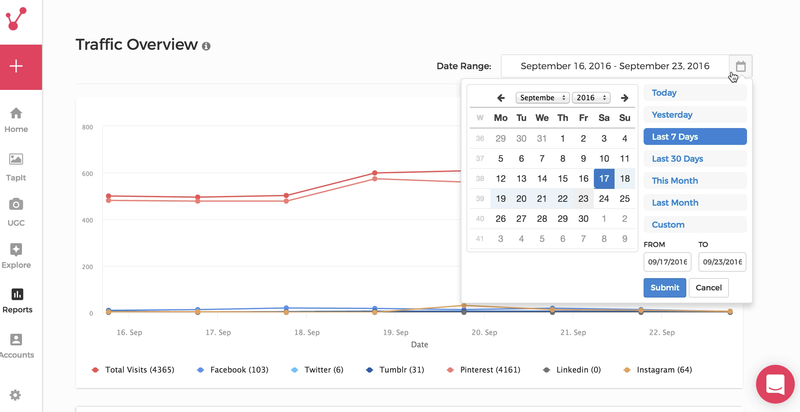 You can toggle the graph display by clicking on the name of the social media platforms at the bottom of the screen. If it appears in black, then the graph will be displayed. If it is greyed out, then the graph will not be displayed. 5. You can also change the date range by clicking on the date range that appears on the top right hand corner of the graph. You will get multiple pre-set options such as Today, Yesterday, Last 7 days, Last 30 days, This month, Last month, and Custom. You can also manually enter in the dates. If you choose custom, you will be able to pick the date range from the calendar. 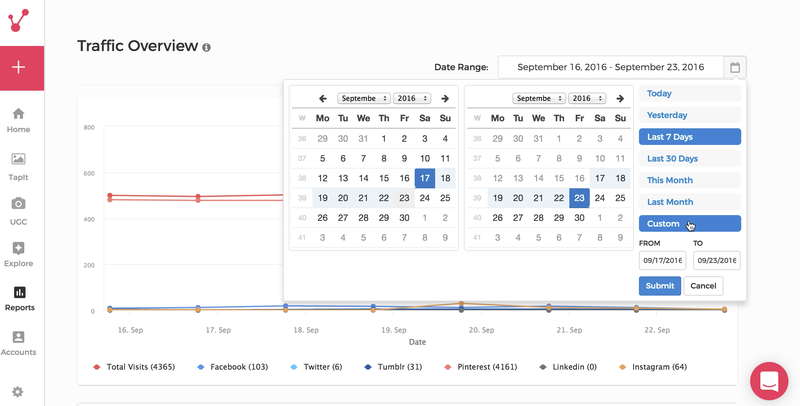 Click on "Submit" when you have selected the date range and you will be able to see the graph with the new date range. 6. 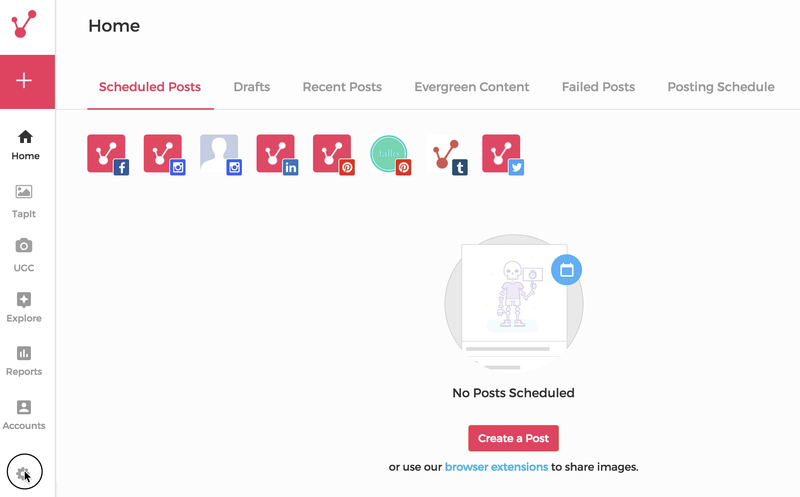 In addition to Traffic Overview, Viraltag's 'Best Times to Post' feature gives you recommended times to post on your social media profiles. This is based on user traffic at different times of the day and each day of the week. Each hour is represented by a square, and the higher the traffic, the redder the square. So, the days and times at which the squares are the reddest are the most ideal for you to post at.